Conclusion: High quality and colourful markings for some striking subjects. Model Alliance continues to produce fine quality decal sheets. 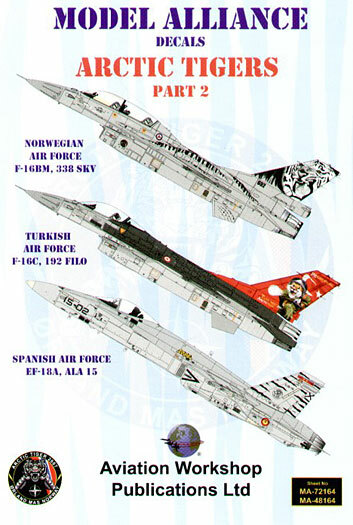 This time, Part Two of the series depicts Spanish, Norwegian and Turkish aircraft in special markings for the 2007 NATO Tiger meet and Exercise Artic Tiger. The decals are available in both 1/72 scale MAS-72164 and 1/48 scale MAS-48164. The decals are superbly printed for Model Alliance by Cartograf and have good colour saturation and register. As usual the carrier film is ultra thin and my experience with Cartograf decals in the past has been that the decals have to be handled carefully and snuggle down into the surface detail well. The carrier film then almost totally disappears under a coat of clear. All the data decals are provided for the three aircraft depicted. The guys have once again done a superb job of the decal artwork and the colour instruction sheet artwork. Five thumbnail size photographs of the aircraft are included throughout the instruction booklet. The instructions also give good detail on the colour schemes for all of the aircraft. Omar Erkmen, who I think was the original artist of the Turkish F16 scheme has provided expert advice and photographs of the Scheme applied to Turkish F16 scheme. F-16BM Sno 962 of 338 skvadron of the Norwegian Air Force based at Orland Air Base in Norway. The aircraft is finished in overall FS 36375 Light Grey. This aircraft has a large low visibility tiger’s head painted on the vertical stabiliser and low visibility tiger stripes painted across the upper fuselage and the fuel drop tanks. F-16C Sno93-0677 of 192 Filo of the Turkish Air Force based at Balikesir Air Base in Turkey. The aircraft is finished in FS 36270 Medium Grey and FS 36118 Extra Dark Grey upper surfaces and FS 36375 Light Grey lower surfaces. This aircraft has a dark red painted fin with a cartoon version of a tiger throwing a snow ball. The fuel drop tanks are painted in the black and red tiger stripes.